Three members of the Civilian Conservation Corps, photographed as they constructed the original water line in 1937. The camera operator is standing on Stevens Knoll. The workers broke through the non Civil War era stone wall behind them. To the left of the stone wall is the monument to the 33rd Massachusetts Infantry Regiment. This view was taken facing northwest, circa 1937. Courtesy of the the Center for Civil War Photography, which has more than 1,000 historic Gettysburg Park images like these on their Flickr. 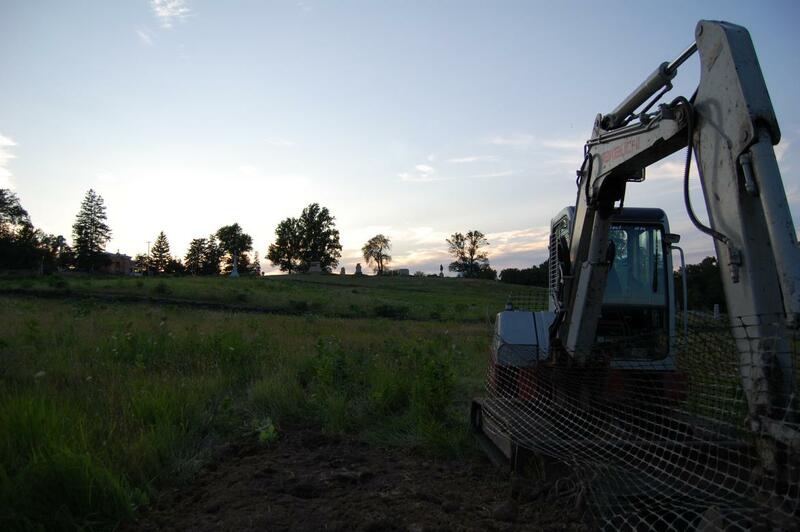 Construction continues on the water line installation for the Spangler’s Spring Restroom. 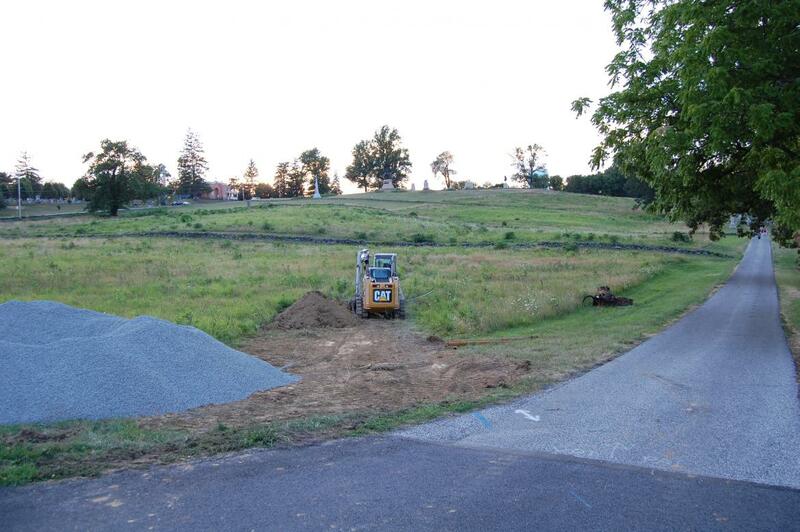 The project costs $295,767 and repeats the work performed by the Civilian Conservation Corps in the 1930s, providing water to a non-historic structure, identical to one the National Park Service had just removed. 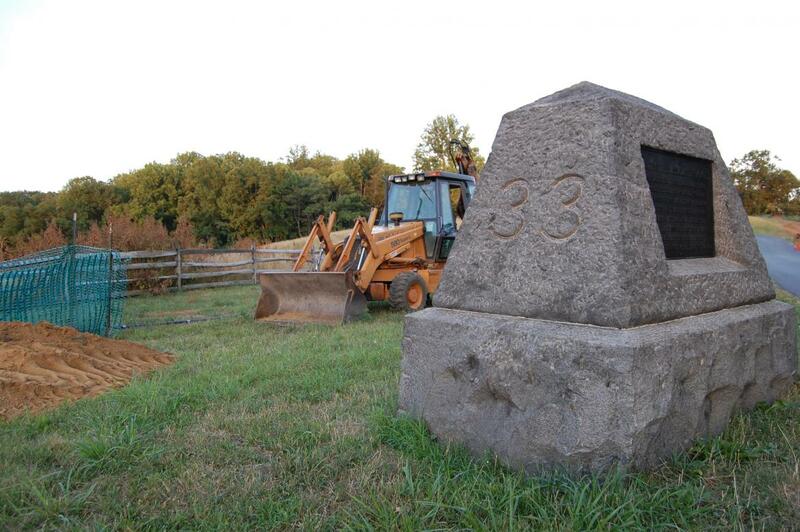 Gettysburg had two CCC camps between 1933 and 1941. They made national news in 1935 when President Franklin D. Roosevelt signed an Executive Order mandating that the CCC camps should be allowed to have African Americans leaders, and not only white foremen. “The War Department and the Park Service moved slowly to implement the president’s directive in forming an all-black company (including officers and supervisors). 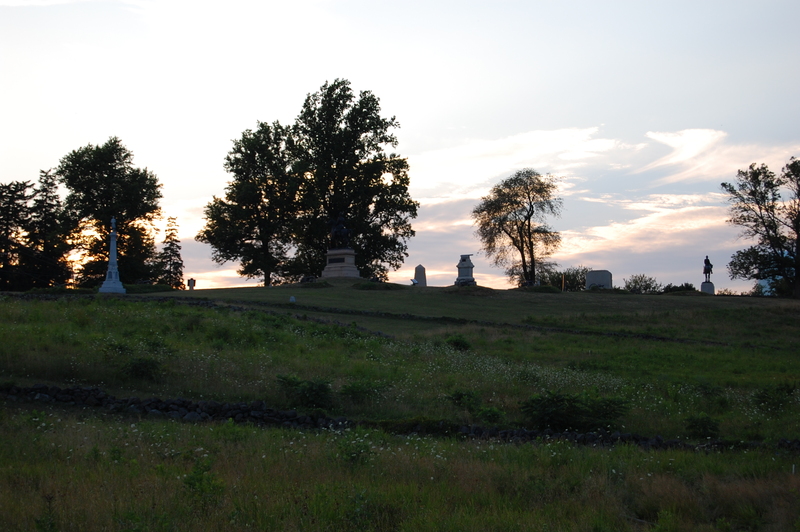 It was decided that the black company in Gettysburg National Military Park be established as a model all-black camp. That camp would then be evaluated to see the feasibility of placing other camps under black supervision. 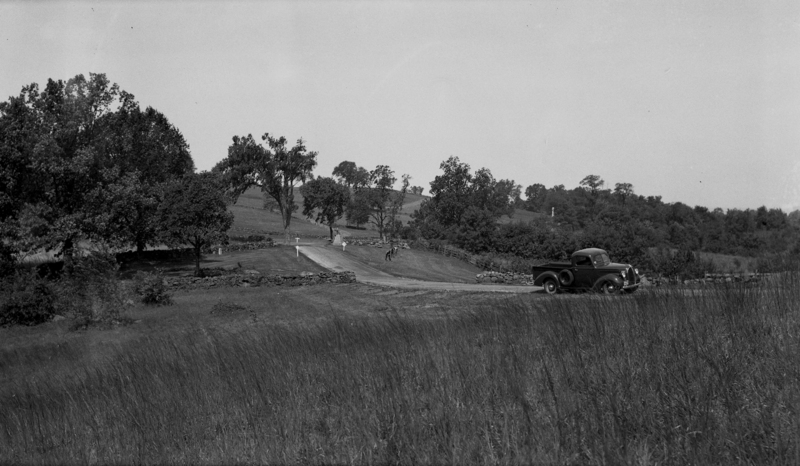 Full conversion from white to black supervisors was completed in 1940 when the last white supervisors at Gettysburg National Military Park were replaced by black foremen.” (Source: The Civilian Conservation Corps andthe National Park Service, 1933-1942: An Administrative History) This view was taken facing northwest, circa 1937. 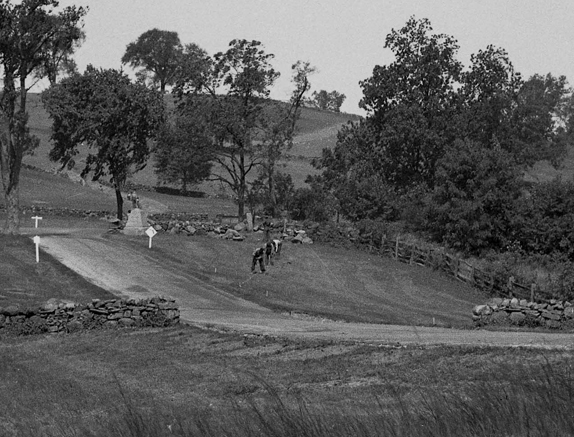 Courtesy of the the Center for Civil War Photography, which has more than 1,000 historic Gettysburg Park images like these on their Flickr. 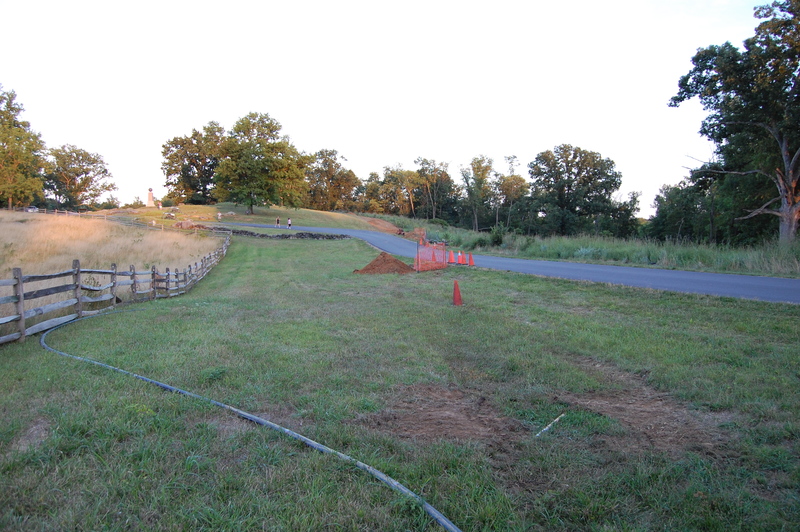 The water line has made its way off of Stevens Knoll … This view was taken facing southeast at approximately 7:25 PM on Monday, July 26, 2010. 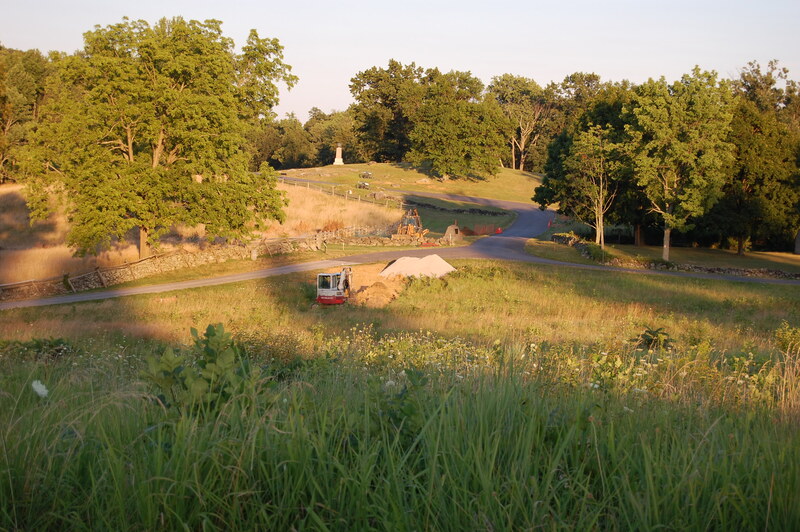 … And reached the base of East Cemetery Hill. This view was taken facing southeast at approximately 7:25 PM on Monday, July 26, 2010. We have noticed that the contractors have been able to use more of the original piping in this area (by threading the new pipe through the old). 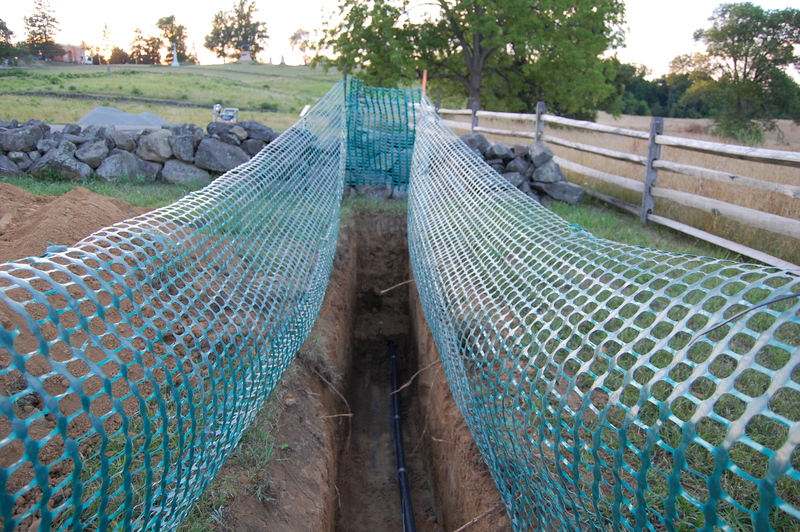 This has resulted in less trenching. One such trench is here, next to the 33rd Massachusetts monument. This view was taken facing southeast at approximately 7:25 PM on Monday, July 26, 2010. Though it is difficult to see in this shot, the new pipe travels above the old pipe until the trench end point, where it enters the old piping to cross under the rock wall and Wainwright Avenue. This view was taken facing northwest at approximately 7:25 PM on Monday, July 26, 2010. 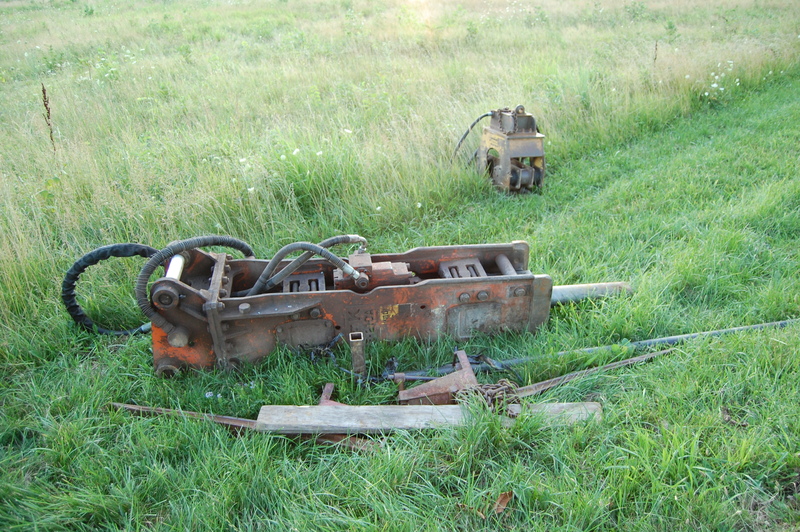 A closer view of the new pipe running over the old. This view was taken facing northwest at approximately 7:25 PM on Monday, July 26, 2010. 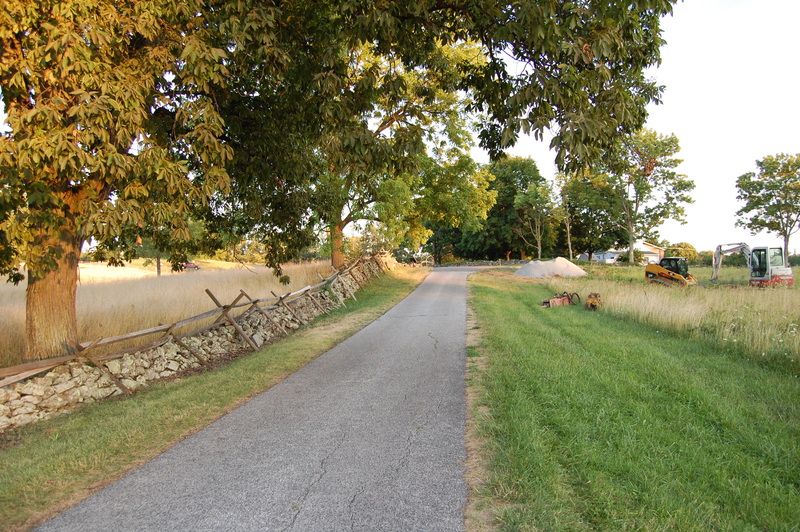 The water line crosses Wainwright Avenue … This view was taken facing southeast at approximately 7:25 PM on Monday, July 26, 2010. 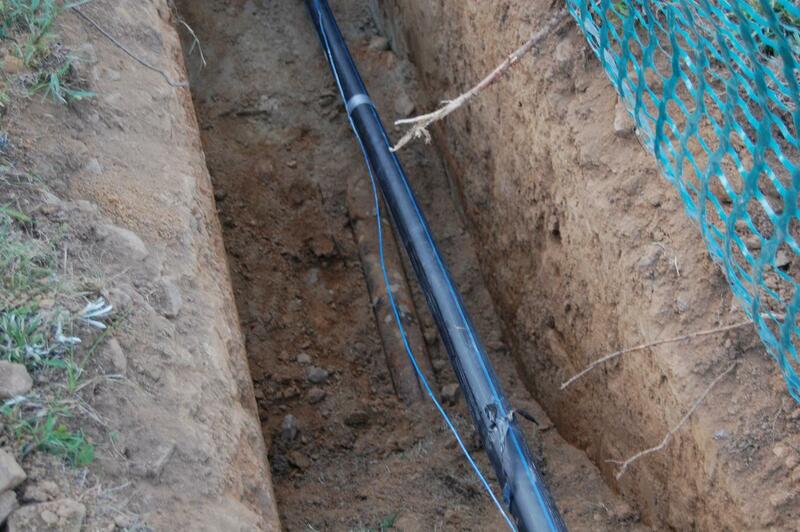 … Where digging begins again and old piping is removed. This view was taken facing northwest at approximately 7:25 PM on Monday, July 26, 2010. Pieces of equipment like this that break up the asphalt/roadway so a trench can be dug have been mostly replaced by the pipe being threaded under the road. This view was taken facing northwest at approximately 7:25 PM on Monday, July 26, 2010. 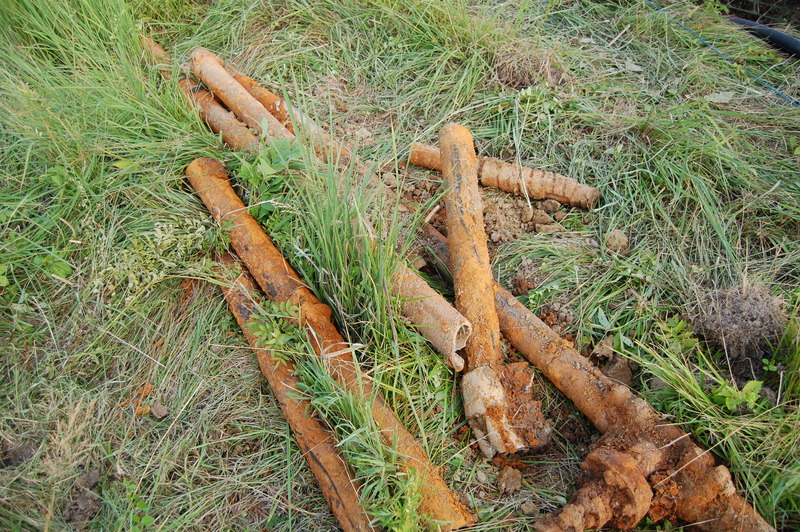 Here is a closeup view of the 1937 piping that has been removed at the base of East Cemetery Hill. This view was taken facing west at approximately 7:25 PM on Monday, July 26, 2010. Worked stopped here Monday afternoon at the base of the hill. This view was taken facing northwest at approximately 7:25 PM on Monday, July 26, 2010. Tomorrow we’ll update you on the rest of the construction progress and provide a few more photos of the CCC’s construction of the original waterline. The Howard equestrian statue is in the right background. This view was taken facing northwest at approximately 7:25 PM on Monday, July 26, 2010.